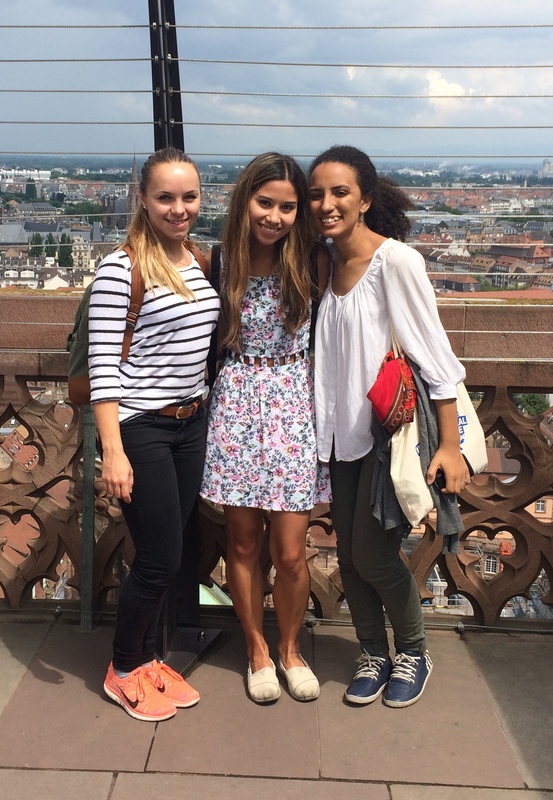 Katrina San Nicholas with friends in Germany. After a summer of laboratory research, I ventured to Karlsruhe, Germany to participate in a program with students from 22 different countries. 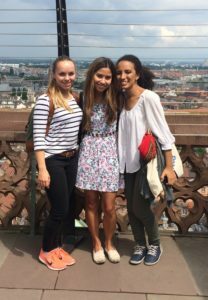 Although I completed classes on international relations and intercultural communication, I learned the most from the casual experiences: taking the trains, walking down the street and eating at German cafes and restaurants. Multicultural groups are not as efficient—but that is okay. I worked on a group poster/oral presentation with a girl from China, a guy from Greece and another girl from Jordan. Because we all had such radically different ideas about what a presentation actually is and how it should be approached, it took us forever to even settle upon a topic. However, our finished result (which included some drawings and a small skit) was much richer and more diverse than could have been created with a mono-cultural group. Sustainable practices are everywhere in Germany. During my trip, I took the train on errands and for day trips to other cities and found the system to be quite manageable. Similarly, the recycling system in Germany, which differentiates between different colors of glass and types of paper, necessitates a bit of extra work but ultimately ensures that a wide range of materials are reused. Making these changes in the United States might be difficult, but Germany does set an example that the country could follow. I feel very fortunate to speak English. Even though I was in Germany, this program was conducted entirely in my language and this put me at a great academic advantage. English is a lingua franca, a business language of the world, and, even though I am gradually learning Spanish, many countries adapt to my communicative structure. As I pursue other adventures around the world, I hope to use this as a way to meet others but also to always respect local languages and customs. Shared interests can transcend all else. While I expected to be having very serious conversations about world politics and cultural variation, I actually connected with the other participants over more superfluous matters. Alkis (from Greece) and I spent several hours talking about the merits of the TV show Lost, and some friends from China and I talked a lot more about fashion than foreign policy. Ultimately, I would highly recommend this particular program. It is ideal for students who cannot go abroad for an entire semester and allows participants to meet people from all over the globe with similar interests. The program is annual and more information can be found here.